A rental housing tower in downtown Kapolei for seniors with low incomes is set to start construction after several years of planning. The 154 senior apartments represent the first phase of Kulana, which also includes a second tower with 143 affordable rental apartments for the general public followed by a third phase comprising a single-­story retail building. A partnership of three California-based companies — Highridge Costa Development Co. LLC, Coastal Rim Properties Inc. and SVA Architects Inc. — is developing the three-phase $130 million project with $80 million from the state. All three companies have developed housing in Hawaii previously. The state financing contribution is from the Hawaii Housing Finance and Development Corp., a state agency that helps facilitate affordable-housing development and provided Kulana’s developer with bonds, a loan and tax credits. 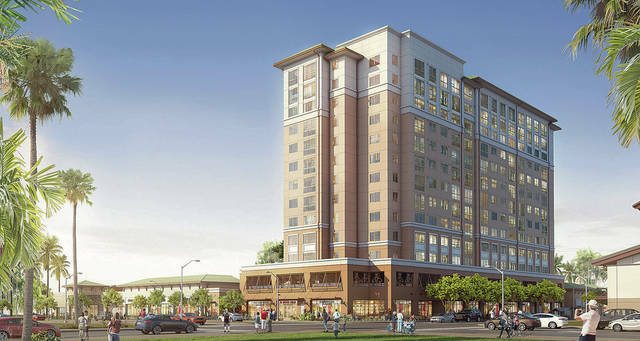 The initial $63 million phase of rental apartments for seniors in a 13-story tower with some ground-floor retail is projected to be finished by early 2020. Ernesto Vasquez, CEO of SVA Architects, said in a statement that the project will help bring new energy to the rapidly growing part of West Oahu. “We are very proud to be a part of Kapolei’s growth and bring affordable housing to an area where affordable housing is in high demand,” he said. Planning for Kulana stretches back several years, and was initially conceived as four towers with 580 residential units on a vacant 3-acre site zoned for commercial use. That plan received some community criticism for adding more homes instead of businesses to downtown Kapolei, where creation of jobs is supposed to make the area a “second city” instead of another bedroom community on Oahu. Project supporters noted that there are several vacant sites for commercial development in Kapolei’s core, and that affordable housing is badly needed. Goodwill Industries of Hawaii Inc. bought the site in 2006 with plans to build a career center but shifted its development plan to a site at Kapolei Business Park and sold the downtown property to a company led by Coastal Rim principal Franco Mola for $4.7 million in 2015. Because the Kulana project is mostly affordable housing, it can be built on land zoned for commercial use under HHFDC authority. The apartments for seniors will be reserved for individuals 55 and older who earn no more than 60 percent of the median income in Honolulu, which equates to $49,020 for a single person or $55,980 for a couple. Eight of the apartments will be reserved for seniors earning no more than half that. Maximum monthly rents for about 100 one-bedroom units would be $1,131 under present income levels. Maximum rents for 22 studios would range from $528 to $968. The project also will have about 20 units with two bedrooms that could rent for up to $1,357 a month. Affordable rents will be tied to Honolulu’s median income for 61 years.